A key issue for next-generation fusion reactors is the possible impact of many unstable Alfvén eigenmodes, wave-like disturbances produced by the fusion reactions that ripple through the plasma in doughnut-shaped fusion facilities called "tokamaks." Deuterium and tritium fuel react when heated to temperatures near 100 million degrees Celsius, producing high-energy helium ions called alpha particles that heat the plasma and sustain the fusion reactions. Recent experiments conducted on the DIII-D National Fusion Facility, which General Atomics operates for the U.S. Department of Energy (DOE) in San Diego, have revealed evidence that confirms these theoretical predictions. Losses of up to 40 percent of high-energy particles are observed in experiments when many Alfvén waves are excited by deuterium beam ions used to simulate alpha particles and higher-energy beam ions in a fusion reactor such as ITER, which is now under construction in the south of France. In the wake of this research, physicists at the DOE's Princeton Plasma Physics Laboratory (PPPL) produced a quantitatively accurate model of the impact of these Alfvén waves on high-energy deuterium beams in the DIII-D tokamak. They used simulation codes called NOVA and ORBIT to predict which Alfvén waves would be excited and their effect on the confinement of the high-energy particles. "Our team confirmed that we can quantitatively predict the conditions where the fusion alpha particles can be lost from the plasma based on the results obtained from the modeling of the DIII-D experiments" said Gerrit Kramer, a PPPL research physicist and lead author of a paper that describes the modeling results in the May issue of the journal Nuclear Fusion. The joint findings marked a potentially large advance in comprehension of the process. "These results show that we now have a strong understanding of the individual waves excited by the energetic particles and how these waves work together to expel energetic particles from the plasma," said physicist Raffi Nazikian, head of the ITER and Tokamaks Department at PPPL and leader of the laboratory's collaboration with DIII-D. 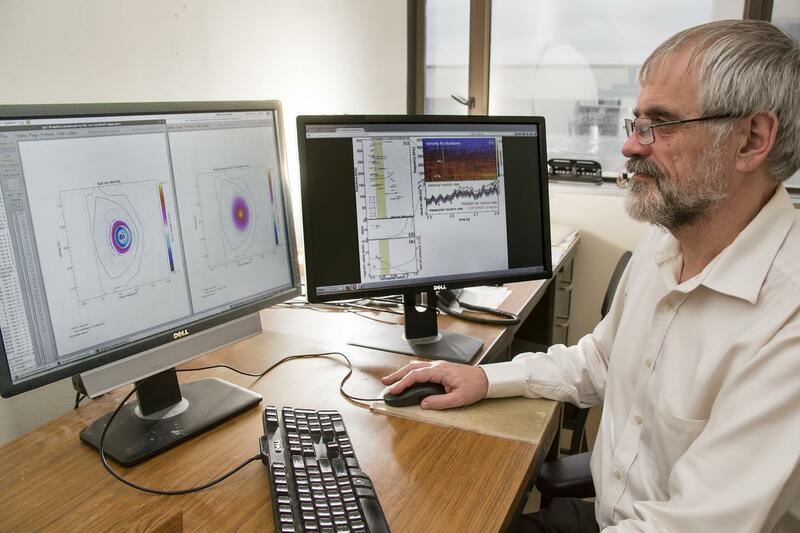 Experiments to test these ideas for reducing energetic particle losses will be conducted in a following research campaign on DIII-D. "New upgrades to the DIII-D facility will allow for the exploration of improved plasma conditions," Nazikian said. "New experiments are proposed to access conditions predicted by the theory to reduce energetic particle losses, with important implications for the optimal design of future reactors."